I don't know anything about this Google Map, except that it seems to have travelled back in time from a dystopian future. 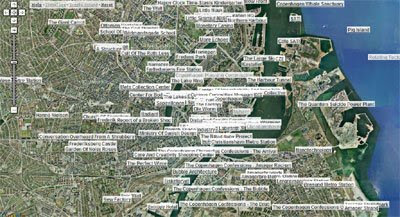 The map shows a satellite view of Copenhagen with a large number of map markers. When you click on a map marker an information window opens with news that is dated a number of years in the future, usually describing a world that seems to have been hit by global warming and a global depression. The splash screen that appears on first entering the site perhaps holds a clue as to the idea behind this map project. The small print contains the sentence "This site is programmed by artists not programmers." I certainly hope that this is an art project, because, if this map has really travelled back from the future, then we are all doomed. Well, at least the Danish are.